May has arrived and brought the sunshine, we hope you had an amazing Bank Holiday Weekend and enjoyed the Party last Friday night. We’ve had some great news and we really wanted you to be the first to know, we have secured the Beach for the 10th year and are super excited to announce that our third Saturday of the month will be going Al Fresco with July & August’s SoSalsaIse being held on the Beach with non-stop Salsa & Bachata music and plus I’m assured there’ll be shelter this Summer so the show will go on and we can’t wait! So excited to be returning to the Beach in Nottingham Square this Summer – This will be our 10th year and we have a feeling this is going to be bigger and better than ever before – A new design and layout for the beach is planned with shelter from the sun (and rain) more space and more music than ever before. We will be there every Wednesday for non-stop fun animation, dancing and Ruedas. Join us every Wednesdays between 18th July and 29th August 2018, these are FREE for EVERYONE and all ages and abilities are welcome, so bring along your Gran and your colleagues and let’s get this going on. 6 pm animation and micro lessons in Salsa – Merengue – Bachata – Rueda – Plenty of time to Social dance and get up and get involved. The even more exciting news is that we will also be in the Square with a completely FREE Salsa Social twice on Saturdays! SoSalsaLise is going to the Beach! 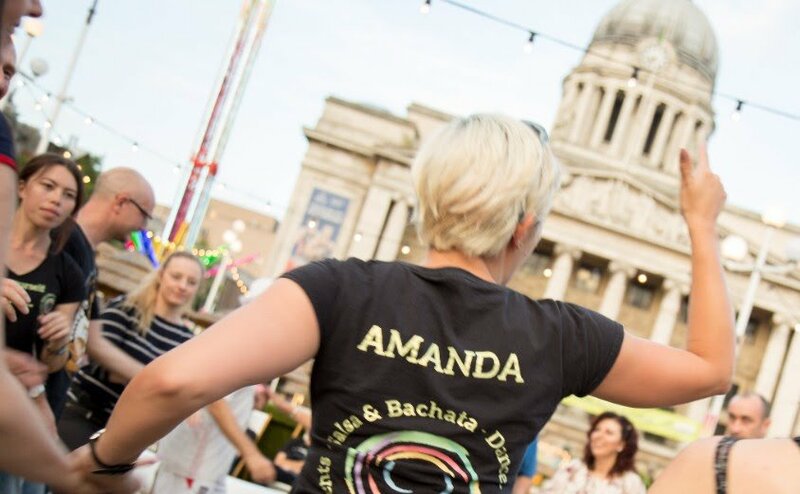 Dance Al Fresco in the Square with non-stop Salsa & Bachata Music from Amanda Hawley + Live Music – does it get any better?! Join us for this 8 pm till midnight Saturday 21st July & Saturday 18th of July. No group lessons Monday 2nd, 3rd 5th of April – this is a gap week for 8-week courses. Week 1 on the 9th of April of for all Improver & Intermediate courses. March is going to take off this Spring, with freezing weather forecast, we have a programme of events to warm your toes and soul! Friday 2nd of March: First Friday Fiesta with Fadi K – Samy El Magico & Carolina Rosa all guest teaching Cuban Salsa & Bachata with Swag! All event details can be found here and discounts available with this e-mail on the door. Saturday 3rd of March: As Samy El Magico & Carolina Rosa rarely teach in the UK due to their International commitments we have arranged an opportunity to learn more from them at a 2hr Workshop 1:30 pm till 3 pm – This workshop will offer something for everyone looking to add flavour, individuality and swag to their bachata style, visit the main event page booking information. We’ve had the most amazing dancing from all our lessons over the past two months and unbelievably it’s time for a new intake & some graduations. We start all our courses on Monday 2nd of October make sure you don’t miss out. Friday – First Friday Fiesta, every first Friday of the month we host a massive party with international superstar Teachers and DJ’s, be sure to get your discounted ticket at lessons and join in the fun, at the Boat Club, Trentside North, West Bridgford, Nottingham. We have the return of the Todo Latino Practica sessions as well as some workshops in music and movement. Join the Todo Latino Dance Family and immerse yourself in a friendly, fun dance lifestyle… you’ll never look back! Autumn is going to see the return of the Todo Latino Practica sessions as well as some workshops in music and movement. Stay tuned for later announcements on this and more. From Monday 26th June until Friday 7th July we’re operating a reduced Summer timetable. New courses start from 10th July across all locations. This month we have Fadi K and Jane Salsa Aldi on the music decks playing your favourite Salsa & Bachata mix. We’re back on the Nottingham Beach and Riviera from mid-July – more details to be announced soon. Just one set of courses left for this year. Check out or new dance space and venue at N-Space (Non Such Theatre) in the below video, home to our Nottingham classes and short courses. The next 2 weeks are all drop-in classes so please use your Todo Credits or pay £5 per class. I’m continuing efforts to secure a better venue so please check the address of the new courses before coming.